The kids were on spring break, and John was touring with the Footnotes in France, so we decided to take a long weekend. Weeks earlier, we had selected the weekend and were planning to spend it in Boston, but on Friday morning the news of the manhunt in Boston made it clear this was not the weekend for a visit. [Indeed, we later heard that the city went into ‘lockdown’ all day Friday, at the request of the Governor.] So we drove the opposite direction, to Montréal, for our own little taste of France. Wonderful decision. Montréal is a beautiful city, and despite the windy gray weather (and a few snow flurries) we had a nice time. We stayed in the neighborhood known as Vieux Montréal, with cobblestone streets and old buildings, part of the original city enclosed by fortress walls. 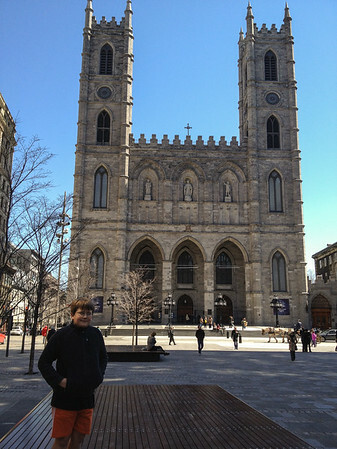 We were two blocks from Notre Dame Basilica, and two blocks from the St Lawrence River. Because of the chilly weather, we sought out indoor activities. We explored a series of simulated ecosystems at the Biodome, including a tropical forest then a series of temperate and arctic settings. We explored the underground city for a little shopping, and checked out some stunning pieces at the Museum of Contemporary Art. And, my favorite part, we took in some excellent French cuisine and Indian food. I took just a few photos.